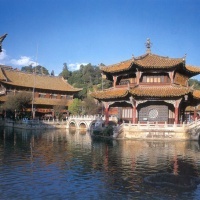 The Yuantong Temple (Yuantong Si) is the largest Buddhist complex in Kunming, and is a target for Buddhist pilgrims. 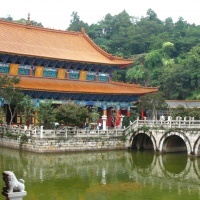 It's located on the south side of the Yuantong Hill and adjacent to the Kunming Zoo. The temple is over 1,200 years old, and has seen many renovations. The Buddhism Halls in the Yuantong Temple consist of that of the Mahayana, Theravada and Tibetan Buddhism, most of them were built in the Ming and Qing dynasties. There are two vivid color clay dragons coil around the pillars in the main hall (Grand Hall), 500 Buddist arhats are also placed there. Faded frescoes on the back wall were painted in the 13th-century, while a new anexe out the back houses a graceful gilded bronze Buddha flanked by peacocks, donated by the King of Thailand and the Thai government. Leading up to the main hall from the entrance is an extensive display of flowers and potted landscapes. The central courtyard has a large square pond intersected by walkways and bridges - with an octagonal pavilion at the center. Art exhibitions and potted landscape miniatures are often to be seen at the temple. On the 1st and 15th of each lunar month, people assemble here to take part in Buddhist services. You may hunt for a vegetarian restaurant nearby the temple, which serve very excellent lunch and dinner. 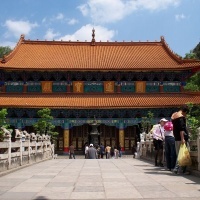 The Kunming Yuantong Temple is open 8am to 6pm. To reach there, you can take bus No. 101 at the train station, or bus No. 4 and No. 59 at downtown. But the most convenient way is by taxi, which should cost RMB10. 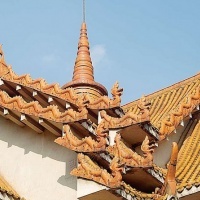 Design and incorporate the Yuantong Temple into your Yunnan tour here!